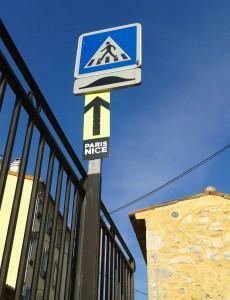 Paris-Nice cycle race.A nice man puts up a sign in Tourrettes-sur-Loup...pointing out the zebra crossing. I was standing by the zebra crossing. Did any of them stop? NO, they did not. SO French.